Liquid biopsy is a minimally invasive technology for detection of molecular biomarkers without the need for costly or invasive procedures. It is a simple and non-invasive alternative to surgical biopsies which enables medical doctors to discover a range of information about a disease or a tumour through a simple blood sample. Circulating cancer cells or traces of the cancer’s RNA or DNA in the blood can give clues about which treatments are most likely to work for that patient. Circulating nucleic acids are protected by extracellular micro-vesicles, mainly exosomes. A test done on a sample of blood to look for cancer cells from a tumor that are circulating in the blood or for pieces of DNA from tumor cells that are in the blood. A liquid biopsy may be used to help find cancer at an early stage. It may also be used to help plan treatment or to find out how well treatment is working or if cancer has come back. Being able to take multiple samples of blood over time may also help doctors understand what kind of molecular changes are taking place in a tumor. The recent interest in nucleic acids in plasma and serum has opened up numerous new areas of investigation and new possibilities for molecular diagnosis. In oncology, tumor-derived genetic changes, epigenetic alterations, and viral nucleic acids have been found in the plasma/serum of cancer patients. These findings have important implications for the detection, monitoring, and prognostication of many types of malignancies. In prenatal diagnosis, the discovery of fetal DNA in maternal plasma and serum has provided a noninvasive source of fetal genetic material for analysis. This development has important implications for the realization of noninvasive prenatal diagnosis and has provided new methods for the monitoring of pregnancy-associated disorders. Plasma DNA technology has also found recent applications in the fields of organ transplantation, posttrauma monitoring, and infectious agent detection. Future areas of study include circulating RNA in plasma and the elucidation of the biology of release, clearance, and possible functionality of plasma nucleic acids. Early detection, disease prognosis, a guide to treatment, a key to unlock the secrets of how cancers evolve. Researchers have high hopes for what they can learn from the biological detritus shed by primary tumours and metastases. Liquid Biopsies -- Miracle Diagnostic or Next New Fad? Thanks to the development of highly specific gene-amplification and sequencing technologies liquid biopsies access more biomarkers relevant to more cancers than ever before. Lovly, C., M. Berger, C. Vnencak-Jones. Collection of ctDNA as a “Liquid Biopsy” has several potential advantages over standard biopsy. Some tumors can secrete small fragments of DNA, called circulating tumor DNA (ctDNA), into the circulation where they are found in plasma. A “liquid biopsy” using blood samples obtained from cancer patients can be performed to detect ctDNA and to identify specific mutations in the ctDNA that may have prognostic and/or therapeutic implications. Valid biomarker signatures from liquid biopsies – how to standardise NGS. The advent of Next-Generation Sequencing (NGS) techniques has revolutionized transcriptomics research and opened numerous avenues for scientific and clinical applications. While reverse transcriptase quantitative real-time PCR (RT-qPCR) is still considered the gold standard of gene expression analysis, its high throughput, single-nucleotide resolution and ever-plummeting costs have made NGS an intriguing and increasingly accessible alternative to this classical method. In addition to mere transcript quantification, RNA-Seq offers exciting new insights such as the discovery of novel transcripts and detection of alternative splice variants or chimeric transcripts. While DNA sequencing yields fascinating discoveries about the genomic makeup of target tissues, RNA-Seq might hold even more potential for biomarker research and drug discovery. Real-time liquid biopsy: circulating tumor cells versus circulating tumor DNA. Liquid biopsy is a new diagnostic concept, i.e., analysis of therapeutic targets and drug resistance-conferring gene mutations on circulating tumor cells and cell-free circulating tumor DNA released into the peripheral blood from metastatic deposits. Here, we discuss current challenges and future perspectives of the liquid biopsy concept in clinical oncology. We postulate that this concept will contribute to a better understanding and clinical management of drug resistance in cancer patients. Liquid biopsy -- monitoring cancer-genetics in the blood. Circulating Cancer Biomarkers: The Macro-revolution of the Micro-RNA. MicroRNAs (miRNAs) are small non-coding RNAs that act as master regulators of many cellular processes. The expression of miRNAs is often deregulated in human tumors, causing the alteration of molecular mechanisms relevant for cancer progression. Importantly, miRNAs are detectable in the blood and their quantity fluctuations are the hallmark of pathogenic conditions, including cancer. Several groups reported the identification of circulating cell-free miRNAs (cf-miRNAs) in the human serum and plasma and demonstrated their diagnostic and prognostic utility. Other studies also shown that it may be feasible to apply such cf-miRNA signatures within screening programs in order to improve cancer early detection. Circulating cf-miRNAs therefore appear to be excellent candidates for blood-borne cancer biomarkers. The potential of liquid biopsies. PURPOSE OF REVIEW: This article discusses the current status and applications of liquid biopsy in nonsmall cell lung cancer (NSCLC). RECENT FINDINGS: The discovery of genetic alterations which are responsible for the development and progression of NSCLC led to the identification of a new generation of molecular biomarkers. However, in NSCLC, it is often difficult in clinical practice to obtain sufficient tumor material for genetic analyses. Therefore, analyses of tumor-specific genetic alterations in the serum or plasma of the patients are particularly valuable because they can provide temporal measurements of the total tumor burden as well as identify specific mutations that arise during therapy. The procedure of taking blood samples to detect tumor-specific genetic alterations is termed 'liquid biopsy'. In particular, it can be used for a variety of clinical and research applications, including response assessment in epidermal growth factor receptor (EGFR)-mutated NSCLC patients receiving EGFR tyrosine kinase inhibitor therapy. 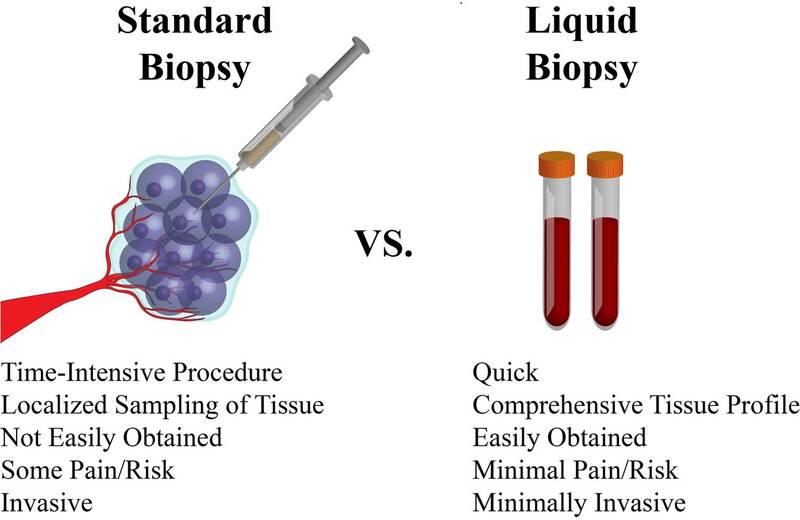 It has been demonstrated that liquid biopsy is a fast and easy way to obtain information on tumor burden and assess the changes of the molecular nature of a tumor during the course of therapy. However, because of the limited amount of tumor material in the blood and yet insufficient knowledge of specific cancer biomarkers, extensive research has to be continued in this field to implement this method into clinical routine. Translating extracellular microRNA into clinical biomarkers for drug-induced toxicity: from high-throughput profiling to validation. Over the past 5 years, extracellular microRNAs (miRNAs) are being vigorously explored as injury biomarkers, including drug-induced cardiotoxicity, hepatotoxicity and nephrotoxicity. Currently, the development of miRNAs as clinical biomarkers has been hindered by the lack of standardization. Therefore, extracellular miRNA-based biomarkers have not been embraced as diagnostic tools. Each platform has its strengths and weaknesses when working with low-input-amount RNA samples from body fluids; the selection of a miRNA quantification approach should be based on the study design. The following review provides a summary of the extracellular miRNA release and stability in body fluids, performances of different miRNA quantification platforms, existing clinical gold standards for drug-induced tissue damage and translation of the miRNA biomarkers from the nonclinical to clinical setting. Small RNA-Seq has emerged as a powerful tool in transcriptomics, gene expression profiling and biomarker discovery. Sequencing cell-free nucleic acids, particularly microRNA (miRNA), from liquid biopsies additionally provides exciting possibilities for molecular diagnostics, and might help establish disease-specific biomarker signatures. The complexity of the small RNA-Seq workflow, however, bears challenges and biases that researchers need to be aware of in order to generate high-quality data. Rigorous standardization and extensive validation are required to guarantee reliability, reproducibility and comparability of research findings. Hypotheses based on flawed experimental conditions can be inconsistent and even misleading. Comparable to the well-established MIQE guidelines for qPCR experiments, this work aims at establishing guidelines for experimental design and pre-analytical sample processing, standardization of library preparation and sequencing reactions, as well as facilitating data analysis. We highlight bottlenecks in small RNA-Seq experiments, point out the importance of stringent quality control and validation, and provide a primer for differential expression analysis and biomarker discovery. Following our recommendations will encourage better sequencing practice, increase experimental transparency and lead to more reproducible small RNA-Seq results. This will ultimately enhance the validity of biomarker signatures, and allow reliable and robust clinical predictions. Normal and tumor cells shed vesicles to the environment. Within the large family of extracellular vesicles, exosomes and microvesicles have attracted much attention in the recent years. Their interest ranges from mediators of cancer progression, inflammation, immune regulation and metastatic niche regulation, to non-invasive biomarkers of disease. In this respect, the procedures to purify and analyze extracellular vesicles have quickly evolved and represent a source of variability for data integration in the field. In this review, we provide an updated view of the potential of exosomes and microvesicles as biomarkers and the available technologies for their isolation. Changing the paradigm: circulating tumor DNA as a ‘liquid biopsy’ for clinical biomarker assessments. Clinical development of targeted anticancer therapies often involves interrogation of key driver alterations through diagnostic assessment of tumor DNA. However, predictive biomarker assessment of tumor tissue has substantial limitations. Recent clinical studies of circulating tumor DNA suggest such DNA may be a paradigm-changing medium for the diagnosis and management of cancer patients that can provide an up-to-date ‘liquid biopsy’ for use in clinical diagnostic assessment. The field is evolving rapidly and numerous studies have shown that highly sensitive technologies allow for detection of genomic alterations in circulating tumor DNA. Here, we consider how these advances have the potential to shape pharmacodynamic and predictive biomarker assessments in clinical trials by providing comprehensive, real-time molecular assessment in a minimally invasive manner. Can circulating miRNAs live up to the promise of being minimal invasive biomarkers in clinical settings? MicroRNAs have been discussed as non- or minimal invasive biomarkers with a remarkable extracellular stability. Despite a multitude of studies in basic research, there are only few independent validation studies on blood-born miRNAs as disease markers. Toward clinical applications numerous obstacles still need to be overcome. They are of technical origin but also fundamentally associated with the source and the nature of miRNAs. Here, we emphasize on potential confounding factors, the nature and the source of miRNAs. We recently showed that age and gender could influence the pattern of circulating miRNAs. On the cellular level, the miRNA pattern differs between plasma and serum preparations. On the molecular level, one has to differentiate between extracellular miRNAs that are encapsulated in microvesicles or bound to proteins or high-density lipoproteins. Using whole blood as source for miRNAs helps to minimize miRNA expression changes due to environmental influences and allows attributing miRNA changes to their cells of origin like B-cells and T-cells. Moreover, unambiguous annotation and differentiation from other noncoding RNAs can be challenging. Even not all miRNAs deposited in miRBase do necessarily represent true miRNAs, just a fraction of miRNAs in the reference database have been experimentally validated by Northern blotting. Functional evidence for a true miRNA should be obtained by cloning the precursor miRNA and by subsequent detection of the processed mature form in host cells. Surprisingly, attempts to finally confirm a true miRNA are frequently postponed until evidence has been established for a likely value as biomarker. 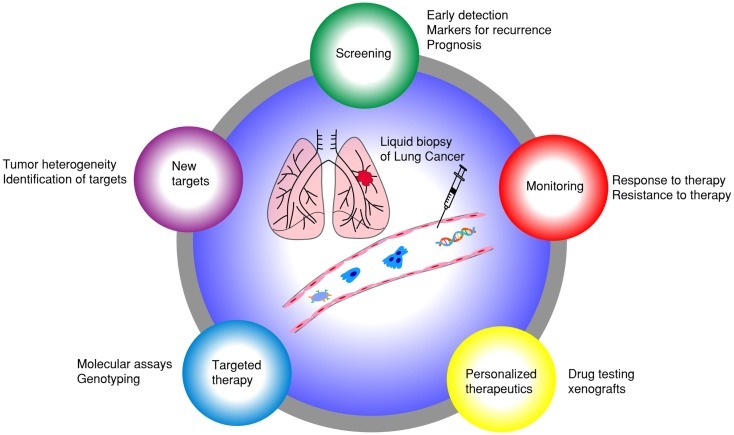 Molecular profile of liquid biopsies -- next generation biomarkers to improve lung cancer treatment. Ecancermedicalscience. 2015 Nov 24;9: 598 -- eCollection 2015. Molecular profiling of liquid biopsies is now emerging as pivotal for cancer biomarker discovery. The low-invasive nature of the approach used for collecting biospecimens (i.e. blood, urine, saliva, etc.) may allow a widespread application of novel molecular diagnostics based on liquidbiopsies. This is relevant, for example, in cancer screening programmes where it is essential to reduce costs and the complexity of screening tests in order to increase study compliance and effectiveness. Here, I discuss recent advances in biomarkers for the early cancer detection and prediction of chemotherapy response based on the molecular profiling of liquid biopsies. Simple, multiplexed, PCR-based barcoding of DNA enables sensitive mutation detection in liquid biopsies using sequencing. An increasing number of studies have focused on circulating microRNAs (cmiRNA) in cancer patients' blood for their potential as minimally-invasive biomarkers. Studies have reported the utility of assessing specific miRNAs in blood as diagnostic/prognostic biomarkers; however, the methodologies are not validated or standardized across laboratories. Unfortunately, there is often minimum limited overlap in techniques between results reported even in similar type studies on the same cancer. This hampers interpretation and reliability of cmiRNA as potential cancer biomarkers. Blood collection and processing, cmiRNA extractions, quality and quantity control of assays, defined patient population assessment, reproducibility, and reference standards all affect the cmiRNA assay results. To date, there is no reported definitive method to assess cmiRNAs. Therefore, appropriate and reliable methodologies are highly necessary in order for cmiRNAs to be used in regulated clinical diagnostic laboratories. In this review, we summarize the developments made over the past decade towards cmiRNA detection and discuss the pros and cons of the assays. Current Status of CTCs as Liquid Biopsy in Lung Cancer and Future Directions. Circulating tumor cells (CTCs) have garnered a lot of attention in the past few decades. Isolation of these rare cells from the billions of blood cells has been a challenge until recent times. With the advent of new sensitive technologies that permit live cell isolation and downstream genomic analysis, the existing paradigm of CTC research has evolved to explore clinical utility of these cells. CTCs have been identified as prognostic and pharmacodynamic biomarkers in many solid tumors, including lung cancer. As a means of liquid biopsy, CTCs could play a major role in the development of personalized medicine and targeted therapies. This review discusses the state of various isolation strategies, cell separation techniques and key studies that illustrate the application of liquid biopsy to lung cancer. A headlight on liquid biopsies: a challenging tool for breast cancer management. Breast cancer is the most frequent carcinoma and second most common cause of cancer-related mortality in postmenopausal women. The acquisition of somatic mutations represents the main mechanism through which cancer cells overcome physiological cellular signaling pathways (e.g., PI3K/Akt/mTOR, PTEN, TP53). To date, diagnosis and metastasis monitoring is mainly carried out through tissue biopsy and/or re-biopsy, a very invasive procedure limited only to certain locations and not always feasible in clinical practice. In order to improve disease monitoring over time and to avoid painful procedure such as tissue biopsy, liquid biopsy may represent a new precious tool. Indeed, it represents a basin of "new generation" biomarkers that are spread into the bloodstream from both primary and metastatic sites. Moreover, elevated concentrations of circulating tumor DNA (ctDNA) as well as circulating tumor cells (CTCs) have been found in blood plasma of patients with various tumor types. Nowadays, several new approaches have been introduced for the detection and characterization of CTCs and ctDNA, allowing a real-time monitoring of tumor evolution. 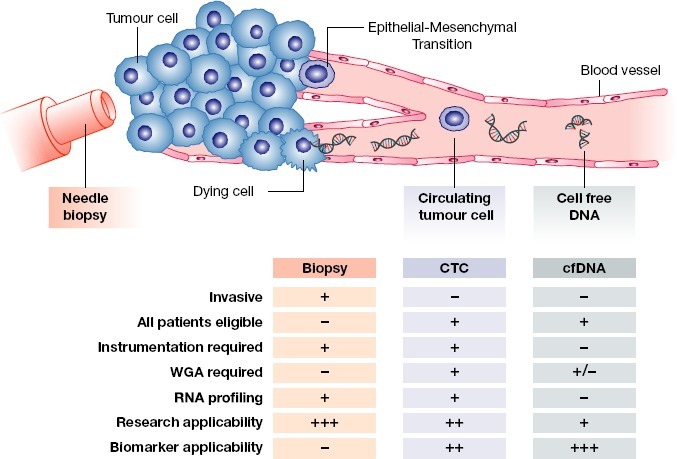 This review is focused on the clinical relevance of liquid biopsy in breast cancer and will provide an update concerning CTCs and ctDNA utility as a tool for breast cancer patient monitoring during the course of disease. New Concepts in Cancer Biomarkers: Circulating miRNAs in Liquid Biopsies. The effective and efficient management of cancer patients relies upon early diagnosis and/or the monitoring of treatment, something that is often difficult to achieve using standard tissue biopsy techniques. Biological fluids such as blood hold great possibilities as a source of non-invasive cancer biomarkers that can act as surrogate markers to biopsy-based sampling. The non-invasive nature of these "liquid biopsies" ultimately means that cancer detection may be earlier and that the ability to monitor disease progression and/or treatment response represents a paradigm shift in the treatment of cancer patients. Below, we review one of the most promising classes of circulating cancer biomarkers: microRNAs (miRNAs). In particular, we will consider their history, the controversy surrounding their origin and biology, and, most importantly, the hurdles that remain to be overcome if they are really to become part of future clinical practice. Breast cancer circulating biomarkers -- advantages, drawbacks, and new insights. As of today, the level of individualization of cancer therapies has reached a level that 20 years ago would be considered visionary. However, most of the diagnostic, prognostic, and therapy-predictive procedures which aim to improve the overall level of personalization are based on the evaluation of tumor tissue samples, therefore requiring surgical operations with consequent low compliance for patients and high costs for the hospital. Hence, the research of a panel of circulating indicators which may serve as source of information about tumor characteristics and which may be obtainable by a simple withdrawal of peripheral blood today represents a growing field of interest. This review aims to objectively summarize the characteristics of the currently available breast cancer circulating biomarkers, also providing an overview about the multitude of novel potential soluble predictors which are still under evaluation. Specifically, the usefulness of a so-called "liquid biopsy" will be discussed in terms of improvements of diagnosis, prognosis, and therapy-prediction, but an overview will be given also on the potentiality of the molecular characterization arising from the isolation of circulating biomarkers and cells. Although this review will focus on the specific case of the breast, in the future liquid biopsies will hopefully be available for virtually any type of neoplasms. Targeting the adaptive molecular landscape of castration-resistant prostate cancer. Castration and androgen receptor (AR) pathway inhibitors induce profound and sustained responses in advanced prostate cancer. However, the inevitable recurrence is associated with reactivation of the AR and progression to a more aggressive phenotype termed castration-resistant prostate cancer (CRPC). AR reactivation can occur directly through genomic modification of the AR gene, or indirectly via co-factor and co-chaperone deregulation. This mechanistic heterogeneity is further complicated by the stress-driven induction of a myriad of overlapping cellular survival pathways. In this review, we describe the heterogeneous and evolvable molecular landscape of CRPC and explore recent successes and failures of therapeutic strategies designed to target AR reactivation and adaptive survival pathways. We also discuss exciting areas of burgeoning anti-tumour research, and their potential to improve the survival and management of patients with CRPC. 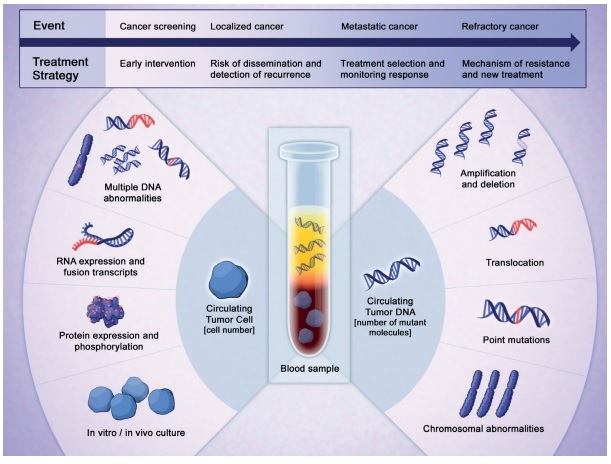 Liquid biopsy for cancer screening, patient stratification and monitoring. Molecular characterization of a patient's tumor to guide treatment decisions is increasingly being applied in clinical care and can have a significant impact on disease outcome. These molecular analyses, including mutation characterization, are typically performed on tissue acquired through a biopsy at diagnosis. However, tumors are highly heterogeneous and sampling in its entirety is challenging. Furthermore, tumors evolve over time and can alter their molecular genotype, making clinical decisions based on historical biopsy data suboptimal. Personalized medicine for cancer patients aims to tailor the best treatment options for the individual at diagnosis and during treatment. To fully enable personalized medicine it is desirable to have an easily accessible, minimally invasive way to determine and follow the molecular makeup of a patient's tumor longitudinally. One such approach is through a liquid biopsy, where the genetic makeup of the tumor can be assessed through a biofluid sample. Liquid biopsies have the potential to help clinicians screen for disease, stratify patients to the best treatment and monitor treatment response and resistance mechanisms in the tumor. A liquid biopsy can be used for molecular characterization of the tumor and its non-invasive nature allows repeat sampling to monitor genetic changes over time without the need for a tissue biopsy. This review will summarize three approaches in the liquid biopsy field: Circulating tumor cells (CTCs), cell free DNA (cfDNA) and exosomes. We also outline some of the analytical challenges encountered using liquid biopsy techniques to detect rare mutations in a background of wild-type sequences. Zomer A, Vendrig T, Hopmans ES, van Eijndhoven M, Middeldorp JM, Pegtel DM. Department of Pathology; Cancer Center Amsterdam; VU University Medical Center; Amsterdam, The Netherlands. Exosomes are specialized membranous nano-sized vesicles derived from endocytic compartments that are released by many cell types. Microvesicles are distinctive from exosomes in that they are produced by shedding of the plasmamembrane and usually larger in size (>1 µm). Exosome biogenesis involves the tightly controlled process of inward budding from the limiting membrane of multivesicular bodies (MVBs). This results in numerous intraluminal vesicles in the lumen of MVBs that contain distinct protein repertoires. It has been suggested that microvesicles shed by certain tumor cells hold functional messenger RNA (mRNA) that may promote tumor progression. We discovered that purified exosomes contain functional microRNAs (miRNAs) and small RNA, but detected little mRNA. Although a clear and decisive distinction between microvesicles and exosomes cannot be made and different subsets of exosomes exist, we speculate that exosomes are specialized in carrying small RNA including the class 22-25 nucleotide regulatory miRNAs. To demonstrate this we developed a co-culture system and found that exosomes are continuously secreted and transferred from Epstein Barr virus (EBV)-infected cells to uninfected neighboring cells. Throughout exosome transfer, the exogenous EBV-encoded miRNAs were delivered to subcellular sites of miRNA-mediated gene repression. Additionally, we found evidence that mature miRNAs are transferred between circulating cells in humans, since we detected EBV-miRNAs in non-infected cells in the peripheral blood of patients that include monocytes and T cells. In this addendum we discuss these findings in the context of recently published papers that advanced our current knowledge of exosome physiology, (mi)RNA function and intercellular RNA transfer. Based on this information we propose that an intercellular (miRNA-based) mode of signal transmission may be well suited in controlling space-confined processes such as the initiation of immune responses in the secondary (peripheral) lymphoid tissues or in a tumor microenvironment. Deciphering the molecular mechanism(s) that control small RNA loading into exosomes and transfer to recipient cells in vitro will provide new evidence for the physiological relevance of vesicle-mediated intercellular communication in vivo. Standardization of sample collection, isolation and analysis methods in extracellular vesicle research. Witwer KW, Buzás EI, Bemis LT, Bora A, Lässer C, Lötvall J, Nolte-'t Hoen EN, Piper MG, Sivaraman S, Skog J, Théry C, Wauben MH, Hochberg F.
The emergence of publications on extracellular RNA (exRNA) and extracellular vesicles (EV) has highlighted the potential of these molecules and vehicles as biomarkers of disease and therapeutic targets. These findings have created a paradigm shift, most prominently in the field of oncology, prompting expanded interest in the field and dedication of funds for EV research. At the same time, understanding of EV subtypes, biogenesis, cargo and mechanisms of shuttling remains incomplete. The techniques that can be harnessed to address the many gaps in our current knowledge were the subject of a special workshop of the International Society for Extracellular Vesicles (ISEV) in New York City in October 2012. As part of the "ISEV Research Seminar: Analysis and Function of RNA in Extracellular Vesicles (evRNA)", 6 round-table discussions were held to provide an evidence-based framework for isolation and analysis of EV, purification and analysis of associated RNA molecules, and molecular engineering of EV for therapeutic intervention. This article arises from the discussion of EV isolation and analysis at that meeting. The conclusions of the round table are supplemented with a review of published materials and our experience. Controversies and outstanding questions are identified that may inform future research and funding priorities. While we emphasize the need for standardization of specimen handling, appropriate normative controls, and isolation and analysis techniques to facilitate comparison of results, we also recognize that continual development and evaluation of techniques will be necessary as new knowledge is amassed. On many points, consensus has not yet been achieved and must be built through the reporting of well-controlled experiments. The majority of microRNAs detectable in serum and saliva is concentrated in exosomes. There is an increasing interest in using microRNAs (miRNA) as biomarkers in autoimmune diseases. They are easily accessible in many body fluids but it is controversial if they are circulating freely or are encapsulated in microvesicles, particularly exosomes. We investigated if the majority of miRNas in serum and saliva are free-circulating or concentrated in exosomes. Exosomes were isolated by ultracentrifugation from fresh and frozen human serum and saliva. The amount of selected miRNAs extracted from the exosomal pellet and the exosome-depleted serum and saliva was compared by quantitative RT-PCR. Some miRNAs tested are ubiquitously expressed, others were previously reported as biomarkers. We included miRNAs previously reported to be free circulating and some thought to be exosome specific. The purity of exosome fraction was confirmed by electronmicroscopy and western blot. The concentration of miRNAs was consistently higher in the exosome pellet compared to the exosome-depleted supernatant. We obtained the same results using an equal volume or equal amount of total RNA as input of the RT-qPCR. The concentration of miRNA in whole, unfractionated serum, was between the exosomal pellet and the exosome-depleted supernatant. Selected miRNAs, which were detectable in exosomes, were undetectable in whole serum and the exosome-depleted supernantant. Exosome isolation improves the sensitivity of miRNA amplification from human biologic fluids. Exosomal miRNA should be the starting point for early biomarker studies to reduce the probability of false negative results involving low abundance miRNAs that may be missed by using unfractionated serum or saliva. Secreted microRNAs -- a new form of intercellular communication. Chen X, Liang H, Zhang J, Zen K, Zhang CY. In multicellular organisms, cell-to-cell communication is of particular importance for the proper development and function of the organism as a whole. Intensive studies over the past three years suggesting horizontal transfer of secreted microRNAs (miRNAs) between cells point to a potentially novel role for these molecules in intercellular communication. Using a microvesicle-dependent, or RNA-binding protein-associated, active trafficking system, secreted miRNAs can be delivered into recipient cells where they function as endogenous miRNAs, simultaneously regulating multiple target genes or signaling events. In this Opinion, we summarize recent literature on the biogenesis and uptake of secreted miRNAs, propose a possible working model for how secreted miRNAs might be sorted and transferred between cells and speculate on their biological significance. Exosomes--vesicular carriers for intercellular communication. Simons M and Raposo G.
Cells release different types of vesicular carriers of membrane and cytosolic components into the extracellular space. These vesicles are generated within the endosomal system or at the plasma membrane. Among the various kinds of secreted membrane vesicles, exosomes are vesicles with a diameter of 40-100 nm that are secreted upon fusion of multivesicular endosomes with the cell surface. Exosomes transfer not only membrane components but also nucleic acid between different cells, emphasizing their role in intercellular communication. This ability is likely to underlie the different physiological and pathological events, in which exosomes from different cell origins have been implicated. Only recently light have been shed on the subcellular compartments and mechanisms involved in their biogenesis and secretion opening new avenues to understand their functions. A liquid biopsy is a simple and non-invasive alternative to surgical biopsies which enables doctors to discover a range of information about a tumour through a simple blood sample. Traces of the cancer’s DNA in the blood can give clues about which treatments are most likely to work for that patient. MicroRNAs in liquid biopsies hold great promise as minimally invasive diagnostic biomarkers for a wide range of diseases and biological processes. These short regulating RNAs have wide-ranging biological potential, are limited in number and are relatively stable in clinical samples such as serum / plasma, urine and other biofluids. However, microRNA profiling in biofluid samples is challenging in many ways. Biofluids contain low levels of RNA, high levels of inhibitors and are susceptible to many preanalytical variables. To address these challenges, we have focused on developing highly sensitive and accurate microRNA detection methods, combined with optimized protocols for sample handling and preparation, and extensive QC procedures. Exiqon offers a range of products and services for highly sensitive, specific and robust detection of microRNAs in biofluids. The techniques we have developed are based on many years’ experience with both microRNA profiling and biomarker discovery and validation in biofluid samples. Next Generation Sequencing (NGS) is a powerful tool for the discovery of novel microRNAs. We have optimized microRNA sequencing specifically for serum / plasma, to enable reliable results using Exiqon’s NGS Services. Our rigorously validated LNA™- enhanced qPCR assays offer sensitive and specific analysis of both known and novel microRNAs. These guidelines focus on setting up microRNA profiling experiments from blood serum and plasma, and urine, but contain useful information for microRNA experiments using other biofluids as well. The guidelines provide important information and tips to ensure successful microRNA profiling using either Next Generation Sequencing or the miRCURY LNA™ Universal RT microRNA PCR System. Pioneering the Liquid Biopsy Revolution -- Enrich. Purify. Discover. QIAGEN’s liquid biopsy solutions empower you to sensitively, specifically and rapidly analyze circulating nucleic acids, giving you the first step towards uncovering valuable biomarkers in your samples. Liquid biopsy is a new, minimally invasive technology for detection of disease biomarkers without the need for costly or invasive procedures. The dedicated kits enable you to enrich and purify circulating free DNA (cfDNA), as well as nucleic acids from circulating tumor cells (CTCs) and extracellular vesicles. Significant progress has been made in the development of new molecular methods to unlock the potential of peripheral monitoring using circulating tumor cells (CTCs) and cell-free DNA (cfDNA) from liquid biopsy samples. Advanced molecular profiling methods using next-generation sequencing (NGS) and digital PCR are enabling clinical researchers to accurately profile mutations of interest in blood samples. These methods may potentially impact our approach to monitoring therapy and recurrence in the future.